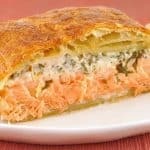 This elegant dish is simply puff pastry-wrapped salmon fillets topped with a mixture of cream cheese, fresh tarragon, parsley and lemon zest. Cut the salmon fillets into six equally sized portions. Season lightly on both sides with salt and pepper and place on a platter. In a small bowl, thoroughly combine the cream cheese, lemon juice, lemon zest, shallot, tarragon, parsley and pinch of salt. Spread the mixture evenly over the top of each piece of salmon. Refrigerate uncovered, for 10 minutes. Gently unfold the pastry sheets onto a lightly floured surface and cut each into 3 equal pieces (approximately 5 x 10-inches each). Roll out slightly to form 7 x 10-inch rectangles. Place a piece of salmon, topping side down, on each pastry rectangle. Fold the edges up over the fish and press to seal the seams, stretching gently if necessary. Place on the prepared baking sheet, seam side down, and brush the tops with the egg wash.
Bake for 25 to 30 minutes, until the pastry is golden brown and the salmon is cooked through. Ask your fishmonger to cut your salmon from the thickest parts of 2 tail-end fillets. This way your portions will be of relatively equal thickness. Also, if you’re not experienced at removing the skin yourself, get him to do that as well.